The United Nations has appointed Antonio Guterres, a former prime minister of Portugal, as the new secretary-general of the Institution. 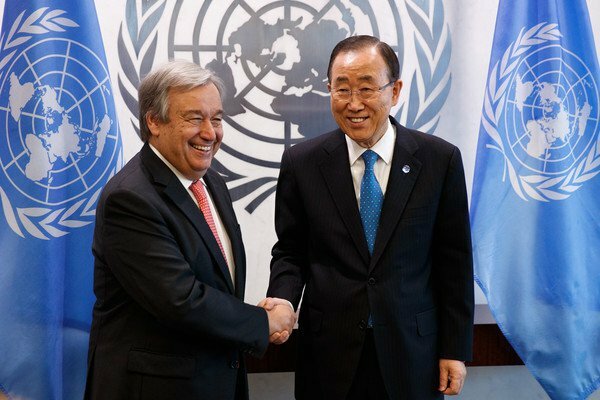 Guterres will take over from Ban Ki-Moon on January 1, 2017. The 67-year-old told BBC at his unveiling that, his first assignment in office would be to end the ongoing conflict in unsettled areas. In his remarks to the BBC, Mr. Guterres said, “I believe it is the international community’s first priority is to be able to end this conflict and use this momentum created by it to try to address all the other conflicts that are interlinked. Mr Guterres who served as a high commissioner for refugees between 2005 an\d 2015, speaks, Portuguese, English, Spanish and French. He was the UN’s high commissioner for refugees from 2005 to 2015.